For more than 25 years, Leonor Lagomasino has devoted her litigation practice to insurers as well as both large and small businesses in a broad variety of complex matters. Ms. Lagomasino's successful representation of insurers primarily includes defending individual and ERISA claims brought under life, health and disability policies as well as prosecuting rescission and agent-related claims. She is frequently consulted on a pre-litigation basis and aggressively defends her clients through the trial and appellate courts. Ms. Lagomasino has also handled various other types of first- and third-party insurance claims, including claims involving Ponzi scheme-related losses and property and casualty. In her diverse business litigation practice, Ms. Lagomasino relies on her financial and tax accounting background to represent banks, commercial real estate companies, commercial property owners and others in matters involving breach of fiduciary duty, lender liability, corporate dissolutions, leasehold disputes, breach of contract, appraisals of real property, bid irregularities, collections, and commercial real estate evictions and foreclosures. Ms. Lagomasino is a frequent speaker at national seminars on life, health and disability topics and has been a contributing author on ERISA compendiums and a reinsurance/arbitration blog. She is also a leader in a preeminent life, health and disability industry organization. 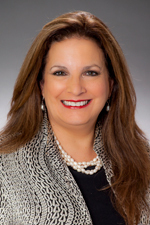 Prior to joining Hinshaw & Culbertson LLP in April 2015, Ms. Lagomasino was for nine years a shareholder in the Miami office of an AmLaw 200 law firm, where she chaired her local office's Women's Initiative Network. Ms. Lagomasino also served as a formal mentor to firm associates and summer associates. Prior to her legal career, Ms. Lagomasino worked as a financial and tax accountant. Representation of insurers defending fidelity and professional liability claims related to the Scott Rothstein Ponzi scheme. Ms. Lagomasino regularly contributed to her prior firm's reinsurance and arbitration blog. She is a past contributor to DRI newsletters and co-authored Manuscript Endorsements, published by the American Bar Association (ABA) Fidelity Section in 2014. Ms. Lagomasino contributed to an ERISA compendium at her prior firm and to the ABA's ERISA compendium to be published in 2015. Ms. Lagomasino enjoys oil painting, photography, travel and gardening.